Tiny speakers let out a 93 decibel melody that's easy to hear. Bluetooth range 20-50m/66-164 foot without obstacle. 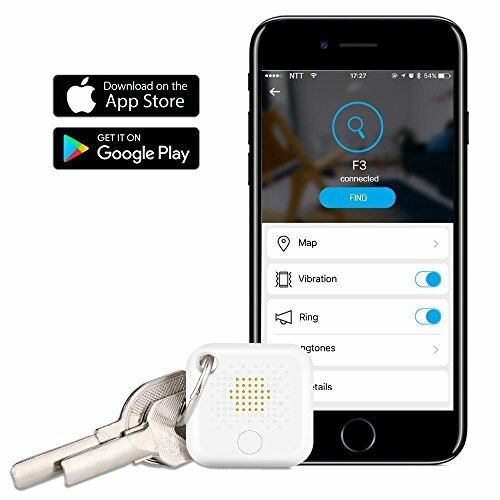 Easily loops onto keychains or attaches the Bluetooth item finder to your phone, wallet, shoulder bag or use adhesive to attach TV remote control, and locate it by alert sound or see its location on a map. TITI Finder APP works with Apple IOS device iPhone, iPad, iPad Mini and Android device Samsung Galaxy Tab, LG HTC with Bluetooth 4.0. IOS: Download the APP from Apple App Store. Use your smartphone to make your TITI ring when it's nearby but out of sight. If your TITI is within Bluetooth range, it will play a loud tune until you find it. Find lost phone when it's nearby but out of sight. Double press your TITI to make your lost phone ring in loudest sound-even on silent. If you're far away from your missing item, open the map to see the last location of your missing item. FIND YOUR PHONE: Simply double press the button on your TITI key tracking device to make your phone ring -even in the silence! MAKING YOUR CHOICE RIGHT: Many times we hope that what we are looking for can make a sound, let us find it, TITI finder can help you , but please note TITI finder is not a panacea. It can help us in life but we need to maintain it in an active state. BEBONCOOL TITI finder with 24-month warranty, Any question you can free to contact us. If you have any questions about this product by BEBONCOOL, contact us by completing and submitting the form below. If you are looking for a specif part number, please include it with your message.